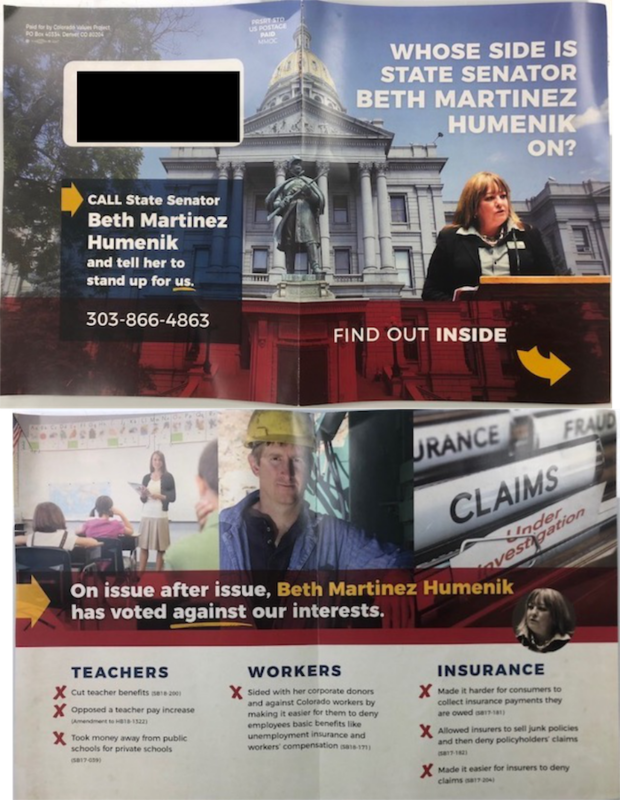 This negative mailer from nonprofit Colorado Values Project says Republican state Sen. Beth Martinez Humenik has "voted against our interests," and suggests recepients call her to complain. It lists several bills and votes, but doesn't mention that Martinez Humenik faces state Rep. Faith Winter in the November election. Both Martinez Humenik and Winter voted for SB18-200, which requires teachers and other state workers to pay more into the pension system. Martinez Humenik apparently voted against a Democratic floor amendment to the state budget to increase teacher pay. Such amendments rarely pass. Martinez Humenik voted for a 2017 bill to provide tax credits for private school tuition. That measure failed. The Republican voted for a bill to allow employers to avoid paying certain benefits for contract workers. That bill failed. She supported a measure to change civil procedures in favor of insurance companies, a measure adjusting motor vehicle insurance and a bill on property insurance claims. All three bills failed. About the messenger: Colorado Values Project is a nonprofit formed in August 2017. It's unclear who's behind the group; we're reaching out to those connected with it. The group's website says it's "protecting the Colorado way of life." The messenger's money: Because the group is a nonprofit, there's no way to find out who is funding it, although the group is collecting donations via Act Blue.